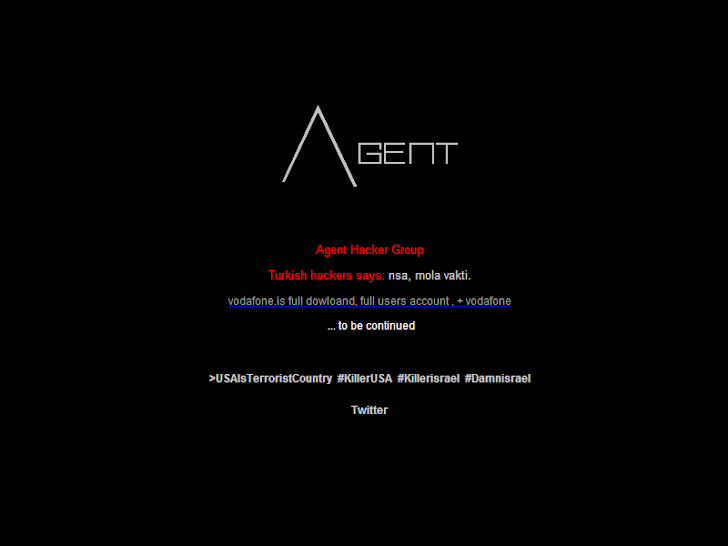 Today Vodafone Iceland was hacked by the Turkish group of hackers Maxn3y (@AgentCoOfficial) who in the past has stolen data from airports' systems, electronic giants and fast food company. The hackers announced via Twitter that he has successfully compromised Vodafone Iceland server and defaced the official website (Vodafone.is), including various other sub-domains including the company mobile site. The hackers disclosed a compressed 61.7MB rar file which is locked with password TURKISH and that contains a collection of files including one titled users.sql that appears to contain the 77,000 user accounts. The file includes user names, social security numbers, encrypted passwords as many other encrypted information. The portal CyberWarNews posted the list of files disclosed and provided information on their content. Multimedia database, nothing critical, 400K of user tracking and logging with user agents, refers etc. SMS logger sender id, sms id, user IP, date. 900k rows of user contact details related to an SMS plan. Full names, phone numbers, email addresses. sms_history.sql and signup.sql explained above. Id, full name (nafn), kennitala (SSN), pnr, confirmed, date, ticket, email, senda, receiver. cart_id, names, social security numbers, postal codes, email addresses, credit card names, nulled credit card numbers and dates, sale amounts. Real name, email addresses, company’s, chairman name. usernames, clear text passwords, active, company’s, full addresses, contact numbers, websites, nulled locations. File name says all, nothing of importance here. Vodafone Iceland website was rapidly restored, but at the time I'm writing it is not reachable.